The winning team from St Joseph’s at the annual Swinburne Inter-school Debating Championship . 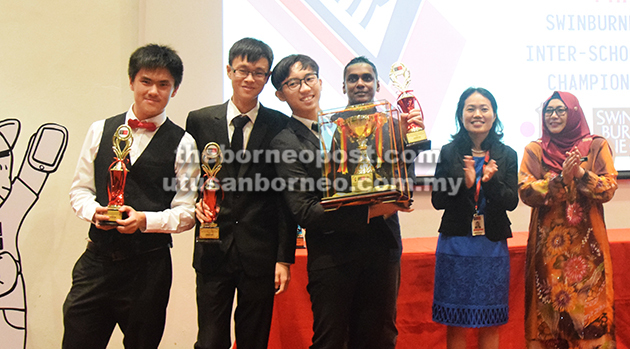 KUCHING: St Joseph’s Private School won the Swinburne Sarawak Inter-School Debating Championship for the second consecutive year. The winning team of Ian Dylan Chai Ee Ann, Joshua Paren Paul and Samuel Chan Han Wei beat SMK Green Road team of Alyssa Yap Xin Yi, Eric Khiu Cheng Ying and Joshua Jong Qian Rong by a whisker with a split decision of 5 to 4. Joshua Paren Paul won the Best Debater in the Final award, also for the second time in a row. The Junior Championship was won by the team from Kolej Yayasan Saad, Melaka with Arianna binti Saiful, Caelystar Valentina Ng May Zher, and Subhashini a/p Ramis. They defeated local stalwarts SMK Batu Lintang, comprising of Aaron Simson, Abigail Sylvester and Melvin Lee. Aaron Simson won the Best Debater in the Final award. Notably, the Indonesian team from SMA Santu Petrus consisting of Crystal Tanika, Patricia Kiarra Adelaide and Teresa Yokia Novantia was the Most Promising Team in the Senior Category. First timers at the championship, they were second in the senior category, an excellent achievement for a team that had little experience outside their school. The Most Promising Team in the Junior Category went to SMK Batu Lintang as they made it all the way to the finals despite being novices. Teams from St Joseph’s Private School won the Best Sarawakian team award in both junior and senior categories, while top speakers were also from the school. Joshua Paren Paul took home the most awards winning the Best Overall Debater, Best Debater in the Final, and Champion in the Senior Category as well as the Swinburne Engagement Award titles. His speech at the Award Presentation ceremony was greeted with cheers from the packed lecture theatre. Three hundred and thirty students, along with their teachers from over 33 schools from throughout the country and Indonesia gathered at Swinburne Sarawak for the 13th annual Swinburne Sarawak Inter-School Debating Championship from Feb 5-8. As one of the largest debate tournaments in the country it attracts debaters from public and private schools, vernacular, national and international residential and day schools. The University flies in experienced adjudicators from all over the country to Kuching to deliver fair and constructive feedback at the tournament. The Swinburne Debaters’ Club organises the annual competition to promote debating and public speaking in English. To support this goal, the university presents Swinburne Engagement Awards to the debaters who are finalists and semi-finalists in the senior category. Such is the positive experience at the tournament that alumni of the annual debate championship return in many guises, from students at Swinburne to volunteers and adjudicators at the event.